Suffering from obesity and eating disorders has been linked to depression cases, a serious disorder that can worsen one’s health and prove to be fatal. The latest report from Gallup-Healthways Well-Being Index shows an alarming figure—that almost one-fourth of obese American citizens have all been diagnosed with depression. What is surprising is not that these people at some point in their lives were depressed, because every person may be at risk of developing the disease; but that the reported percentage exceeds the percentage of people with normal weight, who have simultaneously been clinically-diagnosed with the said psychiatric disorder. Furthermore, the new survey shows that one out of four adult Americans that are obese have higher chances of reporting that they experience various negative emotions — such as anxiety, stress, sadness, anger — compared to those whose weight is considered normal. Gallup also noted that having a little extra weight does not yield the same effects of obesity, considering that results showed how the overweight respondents experienced negative emotions in almost the same league as those with normal weight. The participants who were part of the conducted surveys were classified based on their body mass index scores — as calculated through the participants’ own reports regarding their weight and heights. Obese people were those whose BMI scores start from 30 and more. Overweight people were those whose BMI scores ranged from 25.0-29.9. Respondents with normal weight were those who yielded BMI values from 18.5 to 24.9. Underweight participants were those who yielded BMI scores below 18.5. Based on these classifications, Gallup claimed that 36.3 % of Americans are currently overweight whereas 26.7 % are reportedly suffering from obesity. Simultaneously, 35 % of adult Americans currently enjoy a healthy or normal weight. 23.2 % of adults, all of whom are plagued with obesity, report that they suffer from depression based on clinical diagnosed; whereas only 14.9% of overweight people, 14.3% of normal-weight individuals, and 19.1% of people who are deemed to be underweight reported that they been diagnosed. 41.6 % of the obese individuals are prone to feeling all stressed up; whereas 39.4% of those with normal weight, and 42% of those who are underweight reportedly feel the same. 34.5 % of obese individuals reported that they worry; whereas 30.6% of those with normal weight, and 35.9% of those who are underweight said that they also worry. 15.7% of the obese people reportedly experience anger; whereas 12.6% of those with normal weight and 16% of underweight individuals also feel anger. 19.9 % out of the group of obese individuals experience sadness; where as 16.3% of those with normal weight, and 21.3% of underweight individuals reported that experienced sadness. Such results also show the possibility for clinically-diagnosed depressed people to have higher chances of suffering from obesity, stress, and worry. 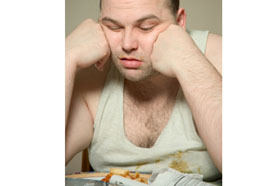 Gallup claims that underweight people account for 1.7 % of adult American citizens. According to an email by Dan Witters, Gallup’s scientist on well-being, to WebMD — many underweight individuals suffer from eating disorders. This incidence significantly explains why the survey results showed that a large percent of those who are underweight have also been diagnosed as depressives. For one, both eating disorders called bulimia and anorexia have strong links to depression, regardless of the victim’s gender; and anorexia appears to have a strong relationship with women’s suicide-related deaths. He further said that in women-related cases, depression strikes prior to eating disorder. Given the strong links between depression and obesity, along with being underweight; it is important for people who suffer from obesity and eating disorders to start anew and commit to a healthy weight loss and maintance plan, through maintaining and losing weight for better overall health—physically, mentally, and emotionally. Setting one’s goals is the first important step before embarking on any attempt at weight loss or weight maintenance. During this preparatory stage, it is important to note that the best way to lose and maintain weight is to do so without losing one’s health. Anyone who wants to take on the task of losing weight in a healthy manner must look far ahead, instead of merely counting a couple of days and a few weeks and wanting to see immediate, drastic results. Having a long-term horizon goal for weight loss and maintenance targets three essentials— safe weight loss and maintenance, successful weight loss and maintenance, and lasting or sustainable weight loss and maintenance. The ideal weight loss and maintenance plan should include proper and regulated exercise, eating a balanced and healthy diet on a regular basis, using natural supplements, changing one’s attitudes towards exercise and eating, and applying lifestyle modificaitons that can be continuously sustained. This suggestion does not pose itself as an option — it is essential and mandatory for optimal success. Ideally, the exercise program must include aerobic exercise for burning calories, through interval training; and weight-bearing exercise for burning calories during sleep, as achieved through muscle-building. The exercise needs not to be immediately laborious. Starting with an enjoyable stroll and a light jog can be good boosters in order to enhance one’s metabolism and energy. Soon, the person becomes more capable of lengthening his allotted time for exercise routines, and adding more activities. A full exercise program that lasts around 30 minutes, done at least three times a week, is more than enough for healthy results. While one is at the process of losing weight, it is essential to never forget that he must be wary of what he eats. It has been too repetitive to speak of how consuming a variety of fresh fruits, fresh vegetables, foods rich in calcium, and foods with high concentrations of healthy fats such as omega-3 fatty acids are important in one’s daily diet. However, these suggestions are cliches that never go wrong. Such foods offer multi-benefits that not only aid a healthy and natural weight loss and weight maintenance program, but also help in reducing one’s risk of developing unwanted diseases. Normal weight and good health can be achieved, simultaneously. Supplements will not work as a magic pull by themselves, but their name already suggests their integral role— to further assist successful and sustainable weight loss and maintenance. Healthy supplements include green coffee bean extract and oolong tea, mulungu, bacopa, herbs and several others. Furthermore, paying attention to what one eats enables the person to automatically refrain from foods that must be avoided—such as highly aunnatural fatty dishes, foods rich in sugar, and processed foods. Eating slowly poses several benefits, primarily through helping keep up with the time needed before the brain acknowledges that the person ise= already full, which usually takes up to 15 minutes. Furthermore, eating a lot as an option to attain comfort in the midst of negative emotions, such as tiredness or depression, must be avoided: Efforts to battle these negative emotions can be diverted to other activities. It is also important not to skip breakfast, and to ensure that it accounts for the largest meal intake in the day. This attitude will stop the person from feeling unnecessarily hungry, and will also enhance his energy levels as he faces the day.